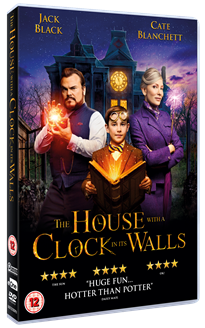 Jack Black and Cate Blanchett star in director Eli Roth’s The House With A Clock In Its Walls which is out on DVD and Blu-ray now from Amblin. This is fantasy family film that all can enjoy and a must for lovers of the Goosebump movies and the Jumanji remake. This enchanted adventure tells the spine-tingling tale of Lewis a 10-year-old orphan, who goes to live with his uncle in a creaky old house with a mysterious tick-tocking heart. Lewis soon learns that Uncle Jonathan (Black) and his spirited neighbour, Mrs Zimmerman (Blanchett), are powerful practitioners of the magic arts. When Lewis accidentally awakens the dead, the town's sleepy facade suddenly springs to life, revealing a secret and dangerous world of witches, warlocks and deadly curses. We’ve got a merchandise bundle up for grabs and to be in with a chance all you have to do is answer a simple question and remember the comp closes on February the 15th. Good luck! You must be 18 years of age or over to enter. The competition closes 15th February 2019. We'll announce the winners shortly after the competition closes. 2. The Competition shall be open from 12:00 GMT 1 February 2019 until 23:59 GMT 15 February 2019 (“Competition Period”). 3. All entries must be received no later than 23:59:59 GMT 15 February 2019 (the “Closing Date”). Entries received after the Closing Date will not be processed. 14. The winners will be one different person, selected at random from all Eligible Entrants (the “Winners”). 16. Each of the Winners will be contacted via the details provided and will be required to provide all requested information including but not limited to their email address and postal address within 48 hours of being so contacted. ZML reserves the right to award the Prize to another Eligible Entrant if this confirmation is not completed within the required timeframe.